John Clifford is a retired financial services executive whose international experience spans strategy, frontline business leadership, risk management and corporate governance within the Bank of Ireland Group from 1967 to 2009. John graduated with first class honours in commerce from UCD, he is a Fellow of the Institute of Bankers in Ireland and is also a graduate of the Advanced Management Programme, Wharton Business School. He is a former Chair of the ICS Building Society and he retired recently from the chair of Bank of Ireland Mortgage Bank. He is a former director of Allied World Assurance Co (Europe) Ltd, where he Chaired the Audit Committee. 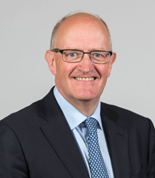 John joined the Board of The Alzheimer Society of Ireland in 2010 and was appointed Chair of the Finance & Audit Committee in 2013 and chair of the Board in March 2016. A self-employed shop owner, Noel has been active in local community affairs for many years during which time he has served on the board of Duleek Credit Union; is current chair of Duleek Development Association and Chairman of a local pre-school group. He is a founding member and current President of Duleek AFC. He was a member of the board of directors of Drogheda United AFC from 2009 to 2013. Noel joined the fundraising committee of ASI’s South Louth Branch in 2015 and, after quickly making a positive impact; he was asked to take on the role of Chair, a role he currently holds. Donal is a qualified Chartered Management Accountant, and father of three. Donal brings a wealth of management experience as a former management accountant with Seafield Fabrics Ltd in Dublin and Group Chief Accountant with Burlington Industries. He served as Finance Director at InPower Europe Ltd in Limerick before setting up his own consultancy firm, offering accounting services to small enterprises. Donal’s wife Gabrielle is Secretary to the Limerick Branch of The ASI for the past number of years and, as a result Donal has been involved in various fund raising activities for the local branch. Donal was an active member of the local accountancy group in the Mid-West from 1980 to 2005 and held various positions over that period including President, Secretary and Treasurer. During that period he was also a member of the Republic of Ireland Division Board and represented CIMA on the Consultative Committee of Accounting Bodies in Ireland (CCABI) for a period. A very experienced and widely respected solicitor, Eugene retired as a partner with Arthur Cox in 2017 having worked with the firm for more than 30 years – four as managing partner and seven as Chairman. He has extensive governance experience, having advised many boards of public, private, and state companies. He has also served as a director of companies in the private, voluntary and state sectors – including seven years on the board of the HSE. His current directorships are: ICON plc (listed on NASDAQ); Fly Leasing (listed on the NYSE); AON Insurance (ISE) and Appian Asset Management Ltd, a private company which he chairs. Eugene is a member of the Ethics and Governance Committee of Chartered Accountants Ireland and is Chair of the Governing Authority of UCD. He previously chaired the Governing body of DIT and the DIT Foundation and was President of the Dublin Chamber of Commerce in 2006. Kieran is a Director of Malin Plc and a member of the President’s Advisory Group in UCD. He is a former CEO of IDA Ireland and former Chairman of CRH Plc. He has served on a wide range of boards of Irish and international companies and has been Chairman of the Governing Authority of UCD and Chairman and President of the Irish Management Institute (IMI). Dr. Patricia Mc Parland works as a consultant in the field of dementia, is a regular speaker and also delivers seminars and training programmes. Her research interests include theoretical approaches to dementia, public understandings and responses to dementia, and everyday ethics. She has co- written a number of dementia related education programmes, including a pan-European Masters. Patricia has personal experience of dementia as her mother lived with Alzheimer’s disease for almost 20 years before her death in 2012, and she is passionate about using her experiential and academic knowledge to improve the lives of those affected by this condition. Currently Patricia is working on a number of projects with Dublin City University and the Institute of Public Health in Ireland. She also runs a Positive Living Network and a coaching and counselling business in Newry. James is a retired teacher of agricultural engineering and has been involved in the community and voluntary sector for more three decades and served as Safety Officer at Ballyhaise College. James also served as Chairperson of the Professional Agricultural Officers Association branch of Impact for five years. James served as Chairperson, Secretary and Treasurer of Ballyhaise Development Association and led the building of the local community centre there. James is also Treasurer of the Cavan branch of the ASI. Tom, a native of Limerick, has resided in Dublin for many years. Over the course of his career with the AIB Group, he held executive positions in lending and branch banking. Tom is a Fellow of The institute Of Bankers in Ireland and he holds an Msc Mgt. from TCD/IMI. He joined the Board of The Alzheimer Society of Ireland in March 2014. Taragh O’Connor is a qualified chartered accountant and experienced finance professional across a wide range of industries, including audit, property management, insurance and banking. Taragh graduated with a Bachelor of Science degree in Accounting from UCC in 1996 and became certified as an FCA by the Institute of Chartered Accountants in Ireland in 2001. She began her training with Ernst and Young in Cork and worked in Tenerife for an international company and then Bermuda with AIG She assisted in the development of strategic operations for all global domiciles, particularly in the Far East. She served on the Board of Directors for numerous AIG clients and other internal entities. On her return to Ireland, Taragh joined Citibank as a Vice President in Financial Planning and Analysis. She managed the Regulatory Reporting team for a period, helping to develop and maintain a strong and open relationship with the Regulator. Taragh also spent significant time managing the Balance Sheet Control function for Citibank Europe plc. In 2016, Taragh took a leave of absence to spend more time with her young family. She joined the Finance and Audit Committee of The Alzheimer Society of Ireland in 2016 and the Board of Directors in April 2018. Ann, a former Carer for her late husband, was Co-Founder of the K-CoRD project (Kinsale Community Response to Dementia) one of 4 Pilot Sites in the Genio Dementia Programme 2012-2015 and funded by the Atlantic Philanthropies. Ann represented K-CoRD a partner in COLLAGE (Collaboration on Ageing) Ireland’s 3 Star Reference Site in The European Innovation Partnership on Active and Healthy Ageing (EIP AHA) in Brussels. Ann is a member of the Advocates Advisory Board of the Dementia-Neurodegeneration Network Ireland (DNNI) at the Mercer Institute, St James Hospital. Ann is a member of The Alzheimer Society of Ireland’s Dementia Carers Campaign Network (DCCN). Pat McLoughlin worked as a management consultant prior to becoming Chief Executive of The Alzheimer Society of Ireland. He served on the management teams of four health boards and was Chief Executive of the South Eastern Health Board and Eastern Health Board. He served as the first National Director of the National Hospitals office and Deputy CEO of the HSE. He was Chief Executive of the Irish Payment Services Organisation until the introduction of European Payments Formats. He has assisted Government, on a pro bono basis, in reviews of public expenditure, local government, childcare, health insurance and the Dept of Justice. He has served as Chairman and a member of a number of voluntary organisations. He holds a B.A. and an L.L.B.from N.U.I.Galway and an M.B.A. from Strathclyde Business School. Audit & Risk Committee: Taragh O’Connor (Chair); Donal Malone (Director); Tom Noonan (Director). Governance, Nomination & Remuneration Committee: John Clifford (Chair); Tom Noonan (Director), Kieran McGowan (Director), Eugene McCague (Director). The Branch Network is an integral part of The Alzheimer Society of Ireland. C/O Bessboro Day Care Centre, Blackrock, Co. Cork. The Chairperson, Tredagh Lodge Day Care Centre, Order of Malta Services Unit, Donore Road Industrial Estate, Drogheda Co Louth.